Happy Thursday, loves! 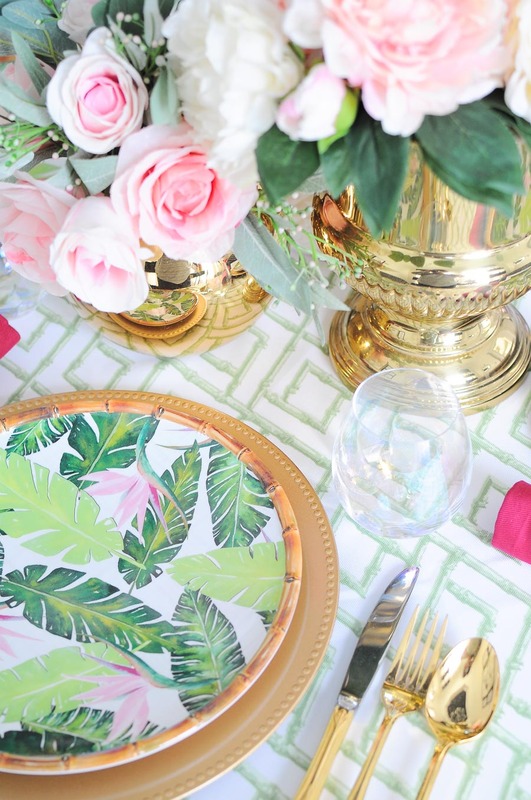 Today I’m thrilled to be sharing a floral and glam chinoiserie inspired tablescape as part of the Beautiful Spring Tables Tour hosted by Pink Peppermint Design. If you’ve landed here from My Life From Home, welcome! Isn’t her table stunning? I’m in love! 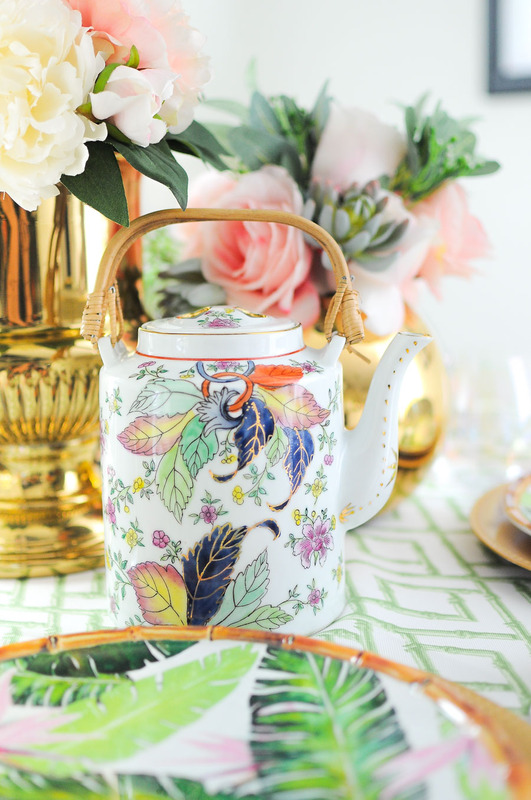 My beautiful spring table is inspired by my love of all things floral, gold and chinoiserie. I found the bamboo-esque tablecloth recently at HomeGoods, and from there this whole tablescape came together. 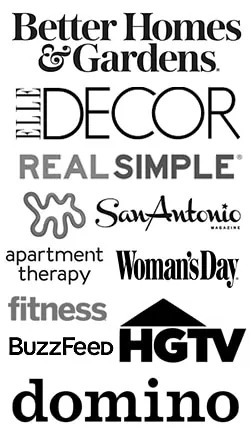 Also prominently featured are my new $44 dining room chairs that you can read all about here. If you checked out my master bathroom refresh (and you should, it’s a stunner! 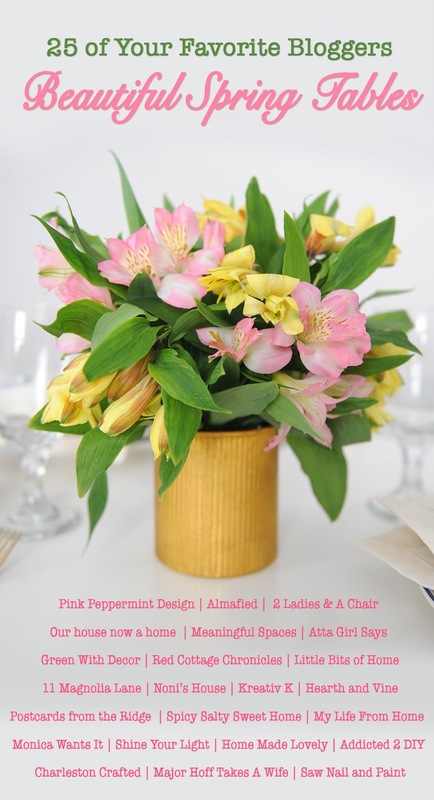 ), you’ll notice the brass urn and faux peonies. They ultimately ended up in the bathroom, but they used to be here. That brass urn was a $5 estate sale find, and it could also be used as an ice bucket for champagne. The pink napkins below were also a lucky rummage sale find- they’re by Williams-Sonoma and I snagged a set of 8 for $2. The chargers are from Dollar Tree, and the plates are by Tommy Bahama and were found at HomeGoods. 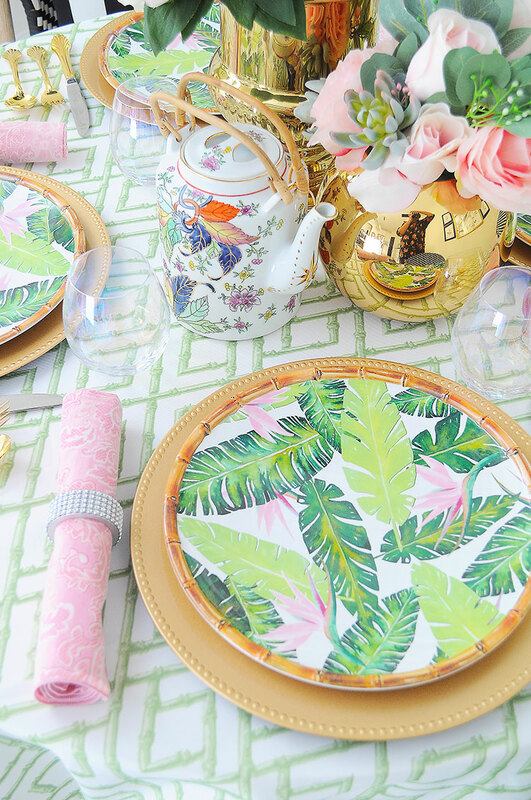 I love how the gold plays off the decor in the center, and the bamboo edge of the plate plays off the tablecloth. Overall the table is cheery and glam. 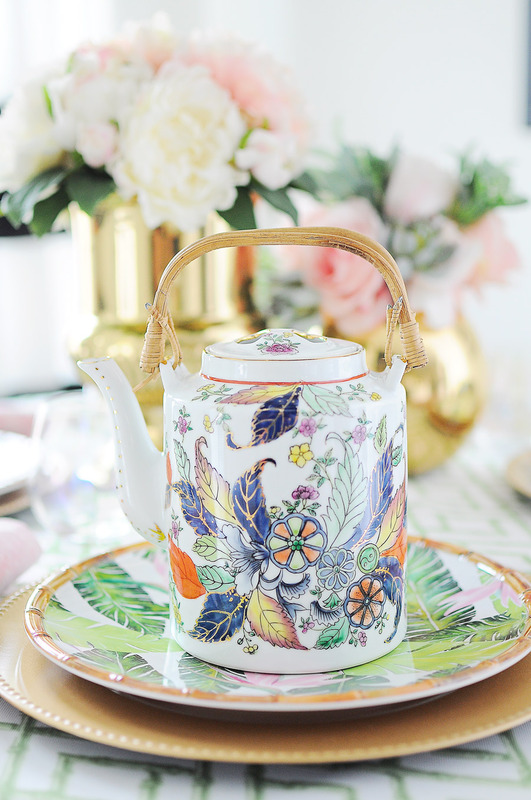 My fave decor accent is the gorgeous tobacco leaf teapot I snagged at a local antique store. I’m obsessed with all things tobacco leaf and will be doing a full blown post on it soon. I mean, seriously… look at how gorgeous it is! 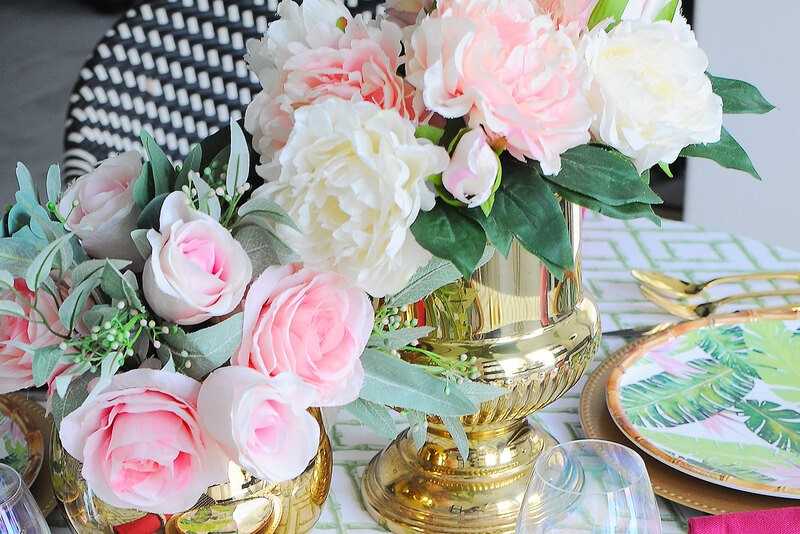 My tablescape mantra is always to mix and match new and old, add in some metallics, adorn with flowers and strike an eclectic vibe. 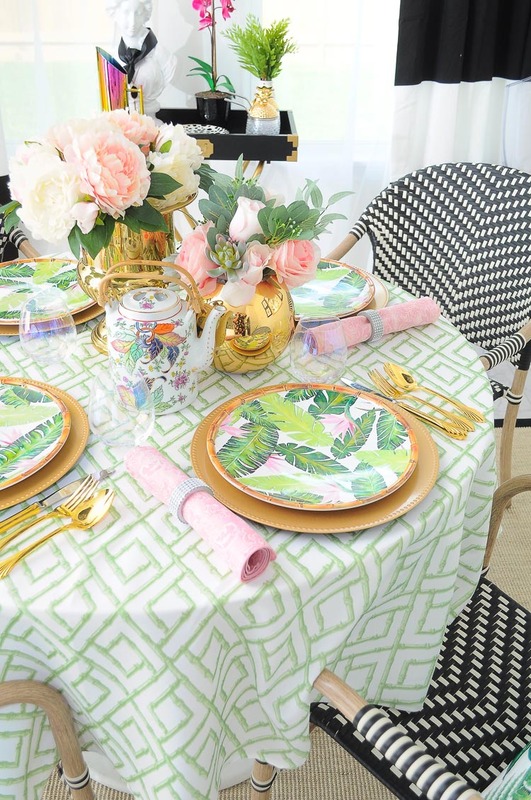 This preppy pink, green and gold chinoiserie tablescape does just that. I think. 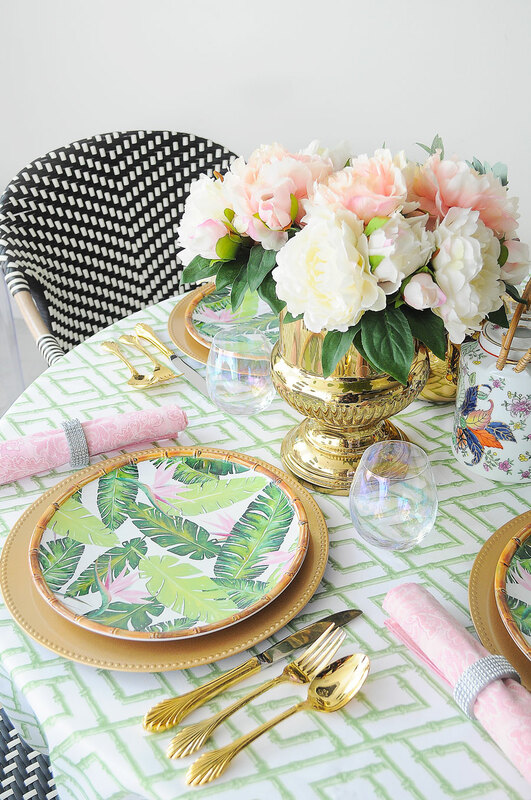 So whip out those gorgeous table linens, plates and flatware and get to decorating. I’m now leading you over to my friend Lisa at Shine Your Light. Her home is so gorgeous, and I especially love her dining room space. You won’t want to miss it! 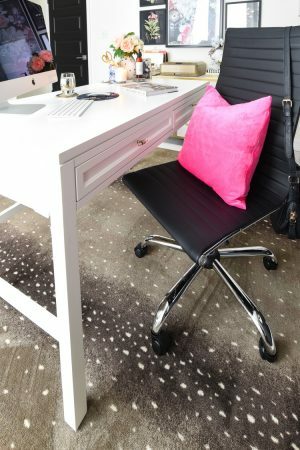 There’s also tons more dining spaces to check out from earlier this week, so stop by and browse a few for some more spring table decor inspo. Monica, your table is so beautiful. That teapot is stunning. Loved it all. 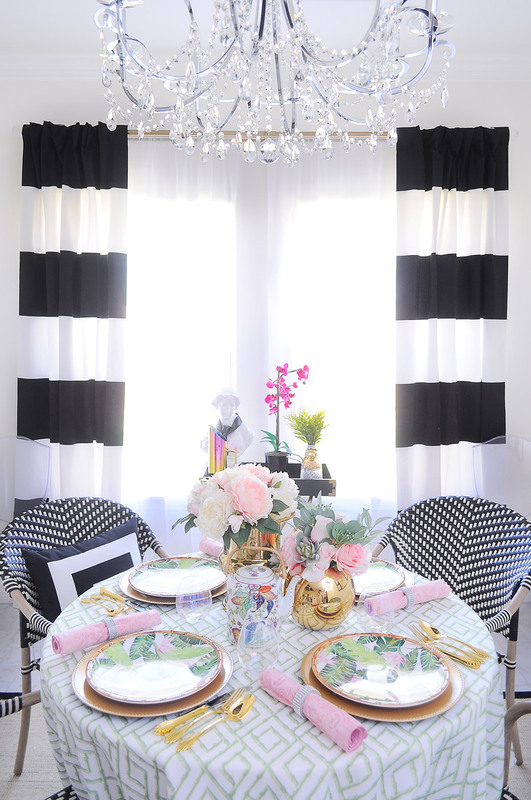 Monica I love your beautiful tablescape! 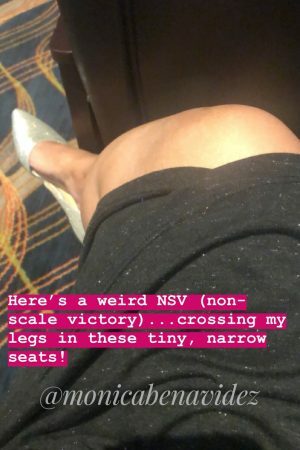 Your use of color is brilliant!!! So gorgeous! Monica I just LOVE the bamboo elements – the tablecloth and plates!! 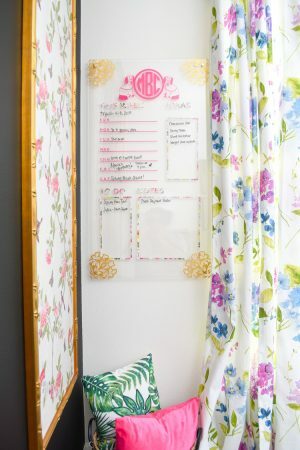 Such a pretty, fresh, springy color scheme, it's all gorgeous!! 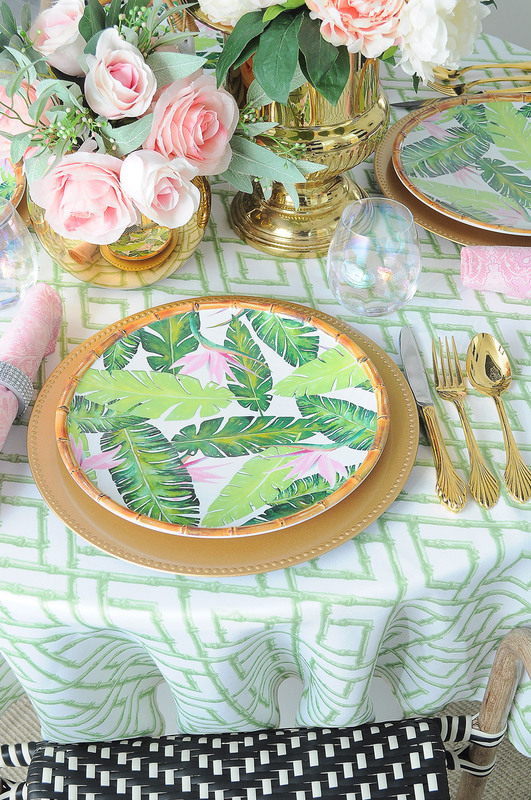 Your table is so pretty and perfect for spring!! 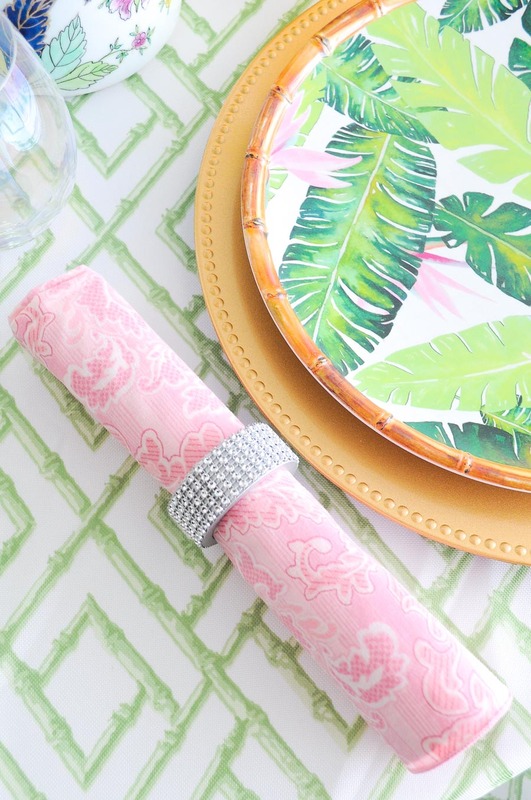 I just love the tablecloth and those plates! Absolutely gorgeous, this is so well done. Love it.